Disciplining children is one of the most unpleasant parental duties and yet one of the most important. Effective discipline takes as much practice for a parent to learn to administer as it does for a child to learn from its administration. Discipline must have a purpose beyond a mere reaction to a child’s negative behavior and above all, it must be done with love. A parent demonstrates love to their child during discipline when they remain calm, confident and consistent. Young children have a very limited scope of the world. They constantly perform behavior experiments to gain a better understanding of the rules that govern life and struggle with conflicting desires of dependence versus independence. Effective discipline addresses negative behavior’s root causes, and therefore understanding the root causes of negative behavior is essential in understanding how to discipline. There are three types/root causes of negative behaviors demonstrated by children that require discipline: primarily, and most common, are routine negative behaviors; next, childish behaviors that are dangerous; and finally, behaviors of willful defiance. Administering effective discipline requires a significant amount of parental resources (time, effort, patience, etc…) and so it is essential to address why effective discipline is vital. Following, we will explore the three types of negative behaviors and their root causes, and finally, offer strategies to reduce negative behavior occurances. Why must we discipline our children? Different philosophical backgrounds will yield different responses to this question. Your philosophical background is relevant in informing your family’s discipline plan because you will need to decide what you feel is good or bad, right or wrong, actions that should be done or should be avoided. If you believe in moral absolutes, you may feel a duty to pass moral principles onto your children. In order to teach your children moral principles, you must help them to learn self-control through effective discipline. If your philosophy is instructed more by moral relativism (for our purposes: believing good is found in pursuing one’s happiness and helping others do the same; and there is no absolute right or wrong) then it is still important to teach your child self-control, from a young age, to enable them to pursue their happiness and promote others towards the same end. Let us assume that our readers want to keep their children from harming themselves and others, so let’s categorize one’s behavior as negative when it negatively affects another individual or themselves. It takes self-control, at times, to avoid negative behaviors. Effective discipline is a tool for teaching self-control. It follows that parents will want to discipline their children to help them avoid negatively affecting another person or themselves. Discipline can also promote happiness in children. Perhaps you have heard of the marshmallow experiment, conducted at Stanford University in the early 1970s. (This study has been re-conducted several time since and has overwhelmingly yielded consistent results, including a new study released Fall 2012). A young child is left in a room with a marshmallow and offered a second marshmallow if they can resist eating the first marshmallow until the adult leaves and returns to the room (about 15 min later). Children who demonstrated delayed gratification by waiting for the second marshmallow had a much higher rate of college graduation, self-assessed happiness, better marriages and saved appropriately for retirement later in life. Although genetic predispositions can cause children to have an easier time passing the Marshmallow Test, nurture still plays an important role. Discipline, nurture in this case, is the key tool to teach self-control and delayed gratification to children. Children lack foresight and are hyper-focused on the here and now. They require maturity and guidance from adults to help them learn self-control. A child’s ability to exhibit self-control is one of the key predictors of that child’s success and happiness later in life. In addition to being concerned about your child’s ability to graduate college or save for retirement, you may also be concerned about your child’s ability to perform well in school (a variable that precipitates graduating from college). A longitudinal study of twins published by Psychological Science in 1991 (L.A. Thompson, et al.) showed only a 20% correlation between identical twins, reared apart, in the area of scholastic achievement (keep in mind that IQ in the same set of twins varied by up to 10% on average); meaning, the ability to earn good grades in school is mostly up to nurture. Children must learn how to control and apply themselves to do well in school and to do this they require discipline. If you can train your child from a young age to respect themselves and others, receive instruction and put forth their best effort, then chances are your child will be able to perform adequately, if not excellently in school. Beyond scholastic and professional achievement, parents are also hopeful that their children will find personal fulfillment in meaningful relationships. One of the primary functions of discipline is to help people get along well with other people. Humans often associate happiness with positive interactions and relationships between themselves and others. We are inherently social beings, but we are also inherently selfish beings. For most of us, depriving ourselves of something that we want for the sake of another is difficult and takes effort, but most of the time it pays to sacrifice for the good of others. When you are kind to others, they generally are kind to you. In fact, you can begin to build a positive reputation of your kindness and reap rewards for good behavior. And of course, there is virtue/happiness to be found in exhibiting kind behavior, just for the sake of kind behavior. Young children are not exempt from the social rules governing reputation. Generally people do, and ought to, give children an abundance of mercy for mistakes, as they have much practice and maturing to complete before being held completely responsible for their misdoings. It can be damaging to a child’s development to be too strict and/or harsh in your discipline or expectations of behavior. But, people do expect a reasonable level of considerate behavior from children. From the nursery caregiver to the mailman in your neighborhood, people are drawn to others who are kind, compassionate and considerate. When a child is routinely unkind, inconsiderate and rude, people will gravitate away from them and that child will slowly build a negative reputation. For instance, the routinely rough kid at the playground who takes toys, pushes, demands, and hits, and who is not effectively disciplined for their negative behavior (and given instruction and permitted to try again), will likely begin to be excluded from social interactions, as mothers will want to protect their children from harm and children will naturally choose considerate playmates. Therefore, ineffectively disciplining a child will not promote their happiness, as it promotes inconsiderate behavior that will detract from their ability to develop meaningful, loving relationships. Additionally, considerate behavior can help children, independently, obtain what they want. Happiness is usually associated with obtaining one’s desires. When a child learns, even as young as 18 months, to use basic manners, they will find others ready to help them when they ask. Demanding children are often ignored or appeased without a positive social exchange. As your children grow, they will find themselves apart from you and it can confuse them to receive a negative look or a reprimand for demanding other adults to do their bidding if they are not expected to use basic manners at home. Children require parents to help prepare them for how the world engages socially. Manners, in the adult world, are used out of respect for ourselves as well as for the person from whom we must request a favor. They create a considerate way to impose upon people that can leave both parties feeling happy after the imposition. Children benefit from learning how to politely impose upon others and can also reap the rewards of feeling good about using manners. Finally, effective discipline can improve your parent-child relationship. Children desire to be given limits and boundaries because they have a very limited understanding of the world. This leaves them in a very vulnerable position, causing, even the healthiest child, frequent anxiety. Their anxiety can lead to more negative behavior, unless it is guided in another direction by a loving and dedicated adult. Children respect adults and feel secure, though they may tantrum and pout, when adults give them reasonable boundaries and hold them accountable for their behavior. Parent’s cannot always play “good cop”, in doing so you deprive your child of their need for you to play the “bad cop” when appropriate. No matter what philosophy your family lives by, it is worth the resources required to create an effective discipline program for your home. You and your child will reap the rewards of learning how to resolve conflict and correct negative behavior in a positive way. Although, discipline is not necessarily a positive experience, it has positive results. Effective discipline is administered out of respect for you as a parent and out of respect for your child; it is loving and requires the parent to remain calm, confident and consistent. What is a routine negative behavior? It is a negative behavior that arises during the hustle and bustle of life. The root cause of the negative behavior is the routine/comings and goings of life. The behaviors are not premeditated and are usually a product of a child’s frustration and interacting with the world. For instance, a two year old child can fetch their shoes when it is time to leave the home. Fetching shoes can be a regular expectation in the household. Most two year old children will not always listen the first time you ask them to find their shoes and may need reminders, but it is important that the expectation that the child can try does not change day to day. If the child chooses to not to try, then they need to be disciplined. Discipline is not harsh or severe, as some of us immediately assume when we hear the word. Discipline is not screaming, hitting, shaming, humiliation or seething in our own frustrations. Rather discipline is loving guidance. Effective discipline, especially in matters of routine negative behaviors, is not focused on punishment, rather conversation and, at times, consequences. Conflicts arising from routine should be expected and addressed with overflowing mercy while still maintaining consistent expectations. Modern schedules are often too busy for toddlers and transitions are very overwhelming. It is hard for them to go from place to place when they can’t understand the big picture. Children have very little sense of time and space and only understand the here and now. If they feel tired and frustrated, they have a hard time looking beyond their feelings to make it out the door, to the park where they will feel better. Because routine negative behaviors usually occur under time constraint, time-outs are not very effective. It is hard to give a 3 minute time out, when you are already running 15 minutes late. Instead, use natural consequences and do not convey a tone of shame or anger. Just speak matter-of-factly: “You spent too much time crying about brushing your teeth before bed. Now there won’t be time for a story tonight.” Do not give in when they then quickly brush their teeth after you say this. Just remind them that it was their choice to spend their time crying and they can try again tomorrow. They will cry and pout- this is normal. When your child does a great job the next night, emphasize the positive results of their great choices and say how excited you are to have time to read a story with them. Remember, from the introduction, that effective discipline requires you to be calm, confident and consistent. Showing mercy is very important and has its place, but too many alterations of your expectations can be confusing to a child, causing them to loose respect for you. Children are still developing a positive internal dialogue. When adults interact with the world our constant internal dialogues work to prepare us for and debrief us from experiences. Children are not yet ready to debrief and prepare themselves without help. When they feel anger, children often externally work through their feelings using screaming and physical hysterics. This is normal; however, you can model healthy internal and external dialogue to your children. To teach healthy internal and external dialogue you may say: “I feel frustrated. I keep asking you to put on your shoes. You are choosing to play instead of listen to what I am saying. I don’t like being ignored.” This dialogue confronts the listener, communicates the speaker’s problem and states their feelings. It is calm, honest and sincere and does not shame. Dialogue modeling is more of a narration, summary of what is happening, rather than a statement of accusation. It seems obvious to adults that frustration and anger result from being ignored in a social exchange, but it is not always obvious to children. As a rule of thumb, assume that you need to state the obvious, in a shame-free and calm tone, for discipline to be effective. Practically speaking, to help young children learn to decrease instances of routine negative behavior, it is advisable to offer them the job of “helper”: “Will you be my helper so that we can get to preschool on-time?”; “I need a helper to clean up the blocks”; “Unless your ready to be a helper, you’ll need to take a minute in your room”; “Only helper’s get big kid jobs like setting the table”. Also, demonstrating solutions for difficult situations can be helpful. For instance, your child stalls when you are trying to get out the door. They can sense your urgency to leave and will not complete their tasks for leaving the home. Keep your words simple. ”You have an important job to do. We cannot leave them home until you do it. When I need to do something I don’t want to, I take a deep breath and then jump into my task. (Demonstrate a breath and jump!) I feel so much better now and feel ready to do my job.” Make their task fun by being silly. Sing a song while working or tell an oral story to distract them from their frustrations. When the tantrum ends up on the ground, kicking and screaming and you don’t have a moment to spare. Stay calm and say, “I can see you don’t want to do your job. We are late. You need to do this now- it is not a choice. Sometimes you have choices and sometimes you don’t.” Then calmly hold their body and manipulate it to complete their task, while they scream and cry. This teaches children that tantrums are not an escape route from problems. They must confront them, head-on, with your loving help. Effective discipline for routine negative behaviors does not need to include punishment, because it results from immaturity and inability to grasp the bigger picture. Stay calm, confident and consistent while using and modeling internal and external dialogue to your children. Narrate success and failure to help your child understand how their behavior affects you and their experiences in life. As they grow, these types of negative behaviors will decrease if you address them properly early in life. 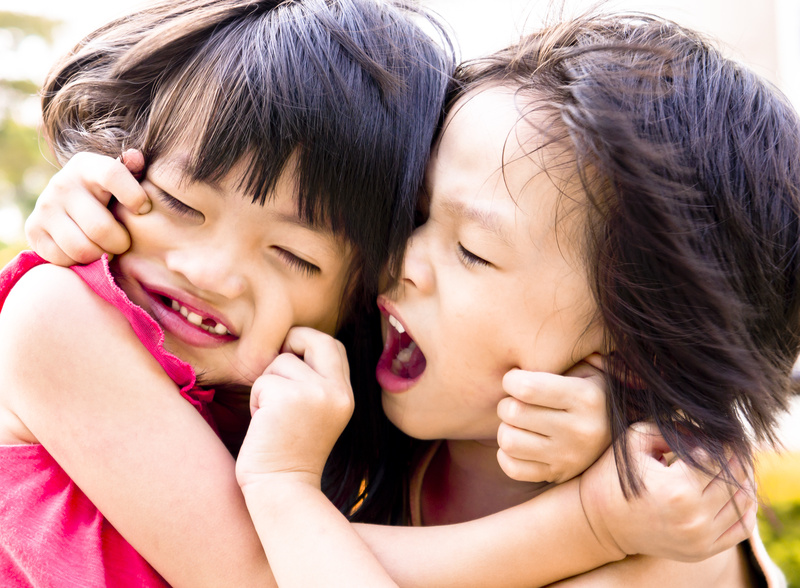 Childish behaviors that are dangerous can include hitting, biting, pulling hair, pushing, kicking, running into the street, refusing to hold your hand in the parking lot, etc…. They are rooted in childishness, which result in dangerous behaviors. Childish behaviors that are dangerous need to be handled in a calm, quick and firm way, but without shame. Just like the routine negative behaviors, a parent needs to speak calmly about the facts. In other words, use narration to help children understand how their behavior affects themselves and others. Screaming and visibly losing your cool when your child does something dangerous does more harm than good because this type of response is unstable and an unstable parental figure can trigger confusion and anxiety for a child. Anxiety can cause more negative behavior, as an anxious child feels pressured to discover the rules that regulate their world independently from the parental figure (who, at the moment, cannot be trusted). Remaining calm, cool and collected under pressure can be extraordinarily difficult, especially when your child runs into the street or bites another child. (It takes practice, so give yourself a break. We are all learning as our children grow.) Children enjoy eliciting emotion from their caregivers, but extreme emotions from caregivers scare children and send the wrong message. For instance, a child runs into the street. Dad yells, “Stop!” and grabs the child. He continues firmly, but calmly, “No running in the street, EVER” while looking straight into the child’s eyes. “I felt scared when you ran into the street. Time-out, inside.” Before inviting the child to play again outdoors, conclude time-out by asking, “What could happen to your body if you choose to run into the street again? You’re right. You could get hit by a car. What happens to your body if you get hit by a car? What can you do instead next time?” Keep the conversation as simple and concise as possible, while ensuring that your child is taught the consequences of their negative behavior. A 15 month old infant can process far fewer words and comprehends less than a 3 year old toddler. Stick to the message, no running in the street, while staying calm and firm and receiving eye contact and ensure there is a consequence every time. Young children struggle to anticipate the consequences of dangerous behavior. Until a child trips, falls, and feels pain and connects the action of falling and hitting the sidewalk with the pain, a child will not necessarily understand that their actions can result in painful occurrences. Young children must be kept from danger and to do so you must train them to listen to you, even when they do not understand why or have a desire to. It is very helpful to come up with a word that is used in every instance where a child is about to touch/do something they should not. Children from zero to three years of age are in an age of discovery and often use their hands and mouths to learn about the world around them. It is important to train your child to stop touching or mouthing something instantly when you tell them too, for their safety. We use the word “ah-ah” in our house. Most Americans use “no-no”. “No” is also an important word for communicating other messages besides danger. To free up the word “no” and remove the negative stigma from it, it is advisable to choose another word to communicate “stop-danger-don’t touch”. It can take a child 10- 50 times to learn to stop their actions when they hear “no” or “ah-ah.” Our goal as parents is to not give up and be consistent. Consistency is important because children have a limited scope of the world. Children are scientists by nature and are constantly trying to discover how their actions affect the world around them. Children test us to see how we respond to situations in life so that they can develop a clearer picture of the rules that govern the world. When we say a child is “testing us”, this is not necessarily negative; rather it is natural and normal. Children instinctively look to adults to learn how to survive in the world. Children are aware of their inability to survive alone. A toddler is transitioning from being a baby (completely dependent on adults) to a child (semi-dependent). They are aware of their new responsibilities during the transition and feel anxious. Children desire consistency from their parents to help them feel secure in their new phase. When parents are consistent, it teaches children rules that can help to inform their decisions. When children understand the rules that govern life, it gives them confidence to engage in the world independently. When parents waiver in their decisions to discipline and demonstrate signs of weakness (“Umm…OK….Ummm…Stop that!…We don’t do that, OK?”), children can sense this weakness and it concerns them. The scientist inside the child questions, “This can’t be right? Let’s try that again to see what happens”. When parents offer firm and calm feedback to negative behavior it sends a clear message to children and makes it less likely that they will need to re-preform the behavior experiment. Assume a child named Charley remembers that the last time he played with mom’s vase, his mom yelled at him. He felt bored prior to discovering the vase again and although his mom’s yelling was negative last time, it felt good to receive attention. Charley notices his mom isn’t looking and he chooses to play with the vase. His mom notices, but is tired and unsure what to do. She lacks confidence in her response, “… Umm, don’t do that, Ok?”. Charley plays with the vase again, but this time his mom loses her cool and yells “No! Why are you doing that!?! Argh!!!”. He is now confused and scared. Instead, Charley’s mom could say firmly, “Ah-ah”. Charley then tries again. His mom walks over, picks him up, holds his chin in her hand and makes him look her in the eyes. “I said, ah- ah. You can play with your Tupperware, but the vase is an ‘ah-ah’ because it is dangerous. It can hurt you. If you choose to touch it again, you will take a time-out.” The rule is clear; the reaction is calm and consistent. Charley knows exactly what to expect next time. He can make a choice. Perhaps he desires a time-out to help solidify the experience and practice what happens when he chooses to break the rules. Toddlers are undergoing one of life’s major transitions (infant to child). Their next big transition comes in the teenage years as they go from child to adult. As toddlers transition from baby to child, they are slowly handed the responsibility of physically caring for themselves and learn how to interact with the outside world. Negative behavior often comes in clumps. Its onset is usually caused by anxiety due to change and the accepting of new responsibilities. Touching back, toddlers crave consistency because they are constructing a world view and are learning rules that govern how the world works. Change upsets their construct and leads to anxiety. To ease anxiety, children constantly preform new behavior experiments to understand the world, causing them to be irritable, volatile and difficult at times. However understandable childish behaviors that are dangerous may be, they require a consequence to alert the child to the danger to himself or another individual, followed by a conversation to teach the child why they should avoid the negative behavior in the future. A consequence, followed by a conversation helps the child to learn learn to take responsibility of protecting themselves and others as they grow. When administering a consequence for a negative behavior, (1) stay calm, confident and consistent. (2) Narrate why you are punishing the child and clearly state the rule that the child broke. (3) Demand eye contact when you speak and do not shame the child. (4) Follow-up the consequence with a positive interaction: cuddle, read a book, go outside and play, do a painting, give a kiss on the cheek and tell them something you love about them. On days packed with negative behaviors and discipline (it is normal to have a day where all you seem to do is discipline), clear your calendar and choose a unstructured activity instead of sticking to your errands, kids festival, house project, etc… Outdoor parks are a great place to visit on “negative days”. Nothing can make a parent more irate than trying to accomplish an adult activity, while being continually interrupted by a child’s negative behavior. Choosing to stop and continue your activity another time is very difficult, but it will help put you in a better position to respond calmly, confidently and consistently to your child. What could be more important? What is willful defiance and how does it differ from other types of negative behaviors? How can I address my child’s willful defiance? Religious philosophies call willful defiance “sin”. Modern philosophies may call it “harm”. No matter what you choose to label “it”, willful defiance is a premeditated decision to deviate from the rules– whether they belong to Man or God in your philosophy. After all, even if don’t believe in moral absolutes, there are still rules that govern society. Willful defiance’s distinction from other negative behaviors is premeditation, or ability to clearly think through the nature of the decision and the consequences prior to making a decision. Quickly defined, willful defiance is knowing the good (good as achieved through your philosophy- virtue or happiness) one ought to do and choosing not to do it. The difference between willful defiance and other types of negative behaviors is that it concerns the heart/soul/being of the child. Conflicts arising from willful defiance are discouraging for parents because they can, uniquely, make your heart ache. Let’s keep the philosophical debate simple and assume that whether you pursue happiness or virtue (religion) for your child, it requires a healthy heart/soul/being in order to obtain happiness and/or virtue. Also assume that a child’s demonstration of willful defiance detracts from their virtue/happiness. Willful defiance, practically, looks like a child yelling “no” or “I hate you” in a parent’s face and slamming the door. It looks like a child knocking his sister over and stealing her toy after watching her play with something he wanted. Willfully defiant behavior is marked by your feelings of deep disappointment in your soul/heart/being just from watching the behavior occur. It is different from the frustration you feel resulting from a routine negative behavior and different from the fear you feel when your child behaves in a foolish, yet dangerous way. “No!”, yells Charley as he hits her again. Willful defiance has now begun. The rules are clear, and the child is choosing to break them. She follows up with a big hug and “I love you”. She invites Charley to try again. Keep in mind that it is normal for children (even very young children- assuming a young child can, in fact, understand “good” and choose to stray from it) to be willfully defiant. Your child’s behavior may anger, frustrate and disappoint you, but no matter how “bad” their behavior may be, screaming and shaming the child are never productive responses (nor is laughing at the childishness of the behavior or overlooking it because the child seems too innocent and sweet through the parent goggles). Instead, use calm, but firm, conversations to draw out your child’s sense of shame/regret. This method frees you up to be a tool of healing instead of condemnation. Direct a dialogue that helps your child conclude that what they did was wrong. As Jiminy Cricket advised, “And always let (their) conscience be (their) guide.” (We must assume that the conscience does exist, whether by natural law or evolutionary development). Shame and humiliation can be overwhelming and cause great anxiety in young children. While shame is a natural and healthy feeling for a human to experience when they do something wrong (or cause harm), it is unhealthy to communicate to a child that their shame is permanent. Shameful feelings should be temporary. Their purpose is to restore the soul rather than to condemn it. I feel shame when I do something wrong. I am not a “bad” person, but I may act in a way that is “bad”. I can experience forgiveness and freedom from shame when I seek reconciliation. When a parent yells at her child in front of others, the shame and humiliation continues because she invites “the others” to experience part of the child’s discipline. When a mother calls a negatively behaving child to her, and whispers her discipline into the child’s ear while friends are in the room, it allows only her and her child to be a part of the discipline. The child and mother can move past the shame together and avoid humiliation completely. Often, humiliating a child in front of others will trigger more negative behavior as the child desperately tries to “save face” in front of others through continued defiance. Parents must also learn to release their anger with their children when their children behave defiantly. As I parent, I am the first to admit my feelings of furry, frustration and disbelief when my kids continually ignore and defy me. It takes focus and effort to temper my own response and to truly forgive my child. Children are not naturally inclined to hold a grudge and will not understand if you do. They will feel anxiety if you cannot let go of the discipline encounter of thirty minutes ago. Instead, they will experience ongoing shame and this can lead to more negative behavior, mostly to get your attention because they fear for the loss of your love (especially if your expression of anger is withdrawing your affection/ignoring). They will need to perform more behavior experiments to see how they can influence you and to check the new rules. Can they win your affection again? Do you love them still? 2) Call them to you- It is helpful to call them “my child”, “son” or “daughter” instead of their name. Being called by the title of the child’s significance to a parent it conveys a message of unconditional love and devotion and makes the child feel safe and comforted, despite their wrongdoing. 4) Ask your child a question to encourage the child to reveal their error- speak calmly and clearly, but very firmly. 6) State the rule and the consequence. 8) Teach the child to apologize and make amends- I like to have the offending child give a hug & kiss to whom they’ve harmed- actions speak louder than words. Also, sharing stories with your children of your own willful defiance as a child can be very helpful. It is comforting for the child to know that they are not alone in what they feeling and doing. Remind your child that you love them no matter what they do and nothing can ever change your love for them. Express that you believe that they can, and will, learn to do better, they just need practice. Tell them what you did growing up to learn to overcome wrongdoing. Children feel afraid when you are visibly angry and fear that your anger means that you don’t love them. If you overreact to a negative behavior, apologize to your child. In doing so, you teach them how making mistakes is a part of life, but that resolving misdoings appropriately is very important and that love can persevere through negative behavior. Now that we understand the need for discipline and it’s root causes, let’s discuss practical ways to reduce negative behavior in our homes (beyond what we already addressed in previous sections). Endure your child’s need for practice: Toddlers (and adults) need repetition in order to learn. The more practice your child experiences with the same outcome, the more secure they feel. To ensure consistency in discipline use the following suggestions in #2-#5. Be concise: Studies show that young children have limited attention spans and a very limited ability to process language. The fewer words and the more facial expression and hand motions (sign language works well) you use to get your point across, the better. This does not mean that you don’t need to explain why their negative behavior is inappropriate It does mean that you need to choose effective body language and verbal language to get your point across. Use the same phrases over and over to make your point. For example: “We don’t hit. If you hit, you will take a time-out.” Say this over and over, every time hitting happens. This will reduce the need for multiple behavior experiments. Don’t ignore negative behavior: If you choose not to address negative behaviors at times, your child will pick up on the inconsistency and it will confuse and cause them to behave negatively more often. Therefore, in the face of exhaustion, frustration, and desire to be the good cop, strive to respect your child’s need to have consistent outcomes. Offer replacements: Children constantly perform physical experiments with their environment: “How high can I jump? How hard do I have to hit this before it will break? Will this iPhone float?”. If they are exhibiting a negative physical behavior it can usually be helped by offering the child a new context to exhibit the same behavior. Think replacements: “Trucks are not for throwing, they are for rolling. You can throw a ball instead” ; or “It is not OK to hit mommy when you are mad. You can say ‘mad’ and hit a pillow instead”. Remember, children are, above all, physical. It is normal to have a need to hit, run, jump and throw, but children need guidance to learn how to channel and control their physical urges. A child doesn’t need to always be calm and collected. They can be rough and wild, but they need to learn to do so in an appropriate manner and in safe places. I advocate rough and tumble play for children of all ages daily, but in appropriate contexts. Be confident! : Recall the 3Cs (calm, confident & consistent). Remaining calm, confident and consistent when disciplining is important because your confidence will be passed on to your child. If you are confident in their abilities, they will learn to be confident in themselves as well. Therefore, it is important to be the leader in your relationship, but not be too domineering. While failure to accept your own leadership in the parent-child relationship leads to role confusion, anxiety and poor behavior in children, over-controlling your child can have the same negative results. Over-controlling parenting is devastating to a child’s sense of self-worth. It causes children to conclude that their experiments to try and do things on their own are futile, that they are failures and cannot exist without their parent’s help. Use “Can Do” Language: If you tell your child that you believe they can do something, it sends them the message that the next task is worth attempting and that they are capable. Use “can do” language when teaching your child. Instead of, “pick up your trucks”, try “you can pick your trucks.” Instead of saying “stop drawing on the walls”, say “you candraw on paper.” Instead of, “stop hitting your sister!” Try, “you can learnto use your words to tell your sister you are angry.” Hearing you say “can” sends the message that you believe in them. State new behavior expectations before the new expectations go into effect. Before adults go into a new setting, we begin mentally preparing to alter our behavior to conform to the new situation (ex: break room to board room). Children often need to practice this type of internal dialogue, audibly, so that they can avoid the need to experiment to learn the new rules. Before changing environments, ask your child how they should behave in the new setting. “Is it OK to run in the library?” “If we need to get a drink of water at school, what can we do?” Children love being able to tell adults the rules. Time-outs: (1)Choose a spot for timeout. It can be necessary to have two degrees of time out locations. For a minor offense, pick a location that is still in view of everyone else, but offers a safe space for crying and a little tantrum. For major infractions, find a more private location that offers, to say delicately, some social isolation. Perhaps a rug inside of a bedroom with a door that closes. 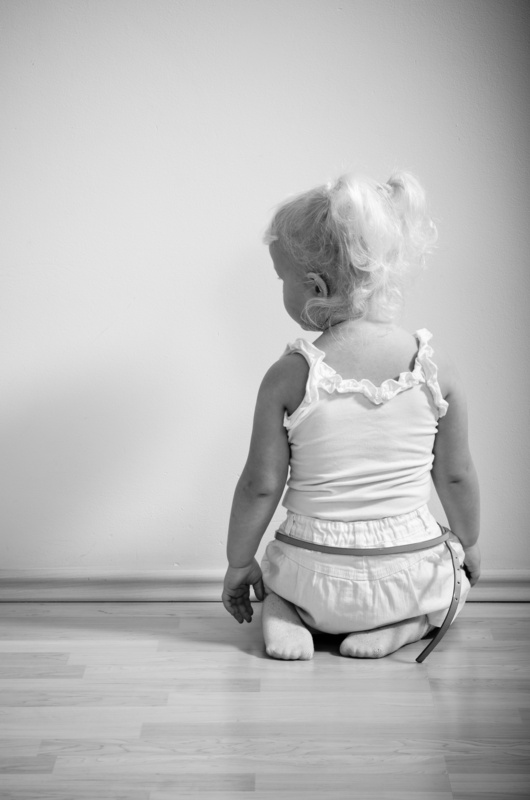 (2) Ask the child to walk himself and sit in the time out alone. (3) You decide how long time-out will last, not the child. I choose based upon how grievous the offense was. Small problems are 1 minute, but serious offenses might be up to 5 minutes for a 4 year old. Don’t wait too long, young minds tend to wander and forget what was happening before time-out. Explain to the child how he child will know when he is done. I like to use a timer. The child can be told to come and find their caregiver when they hear the timer beep. This gives children more ownership of their discipline. (4) Save apologies for after time-out, as apologies are a great resolution. Parents and children need a positive resolution after negative behavior: apologize, give/receive a hug and hear “I love you”. Children need practice apologizing to other children and adults. Apologizing will look and sound different at different ages. Children are more physical than verbal and so offering a hug can be more meaningful than saying “I’m sorry” for a young child. An apology must be offered by the offending child every time they cause harm to another individual. Failing to facilitate an apology will likely result in the negative behavior occurring again. (5) Beware- Time out can be a game to a small child. As we learned earlier, children want to learn the rules that govern the world. They also understand that learning requires practice, which is why you will see a toddler hit a child, take a time out, do it again and go sit themselves in timeout the second time. This seems funny to adults, but it is serious work for a toddler. 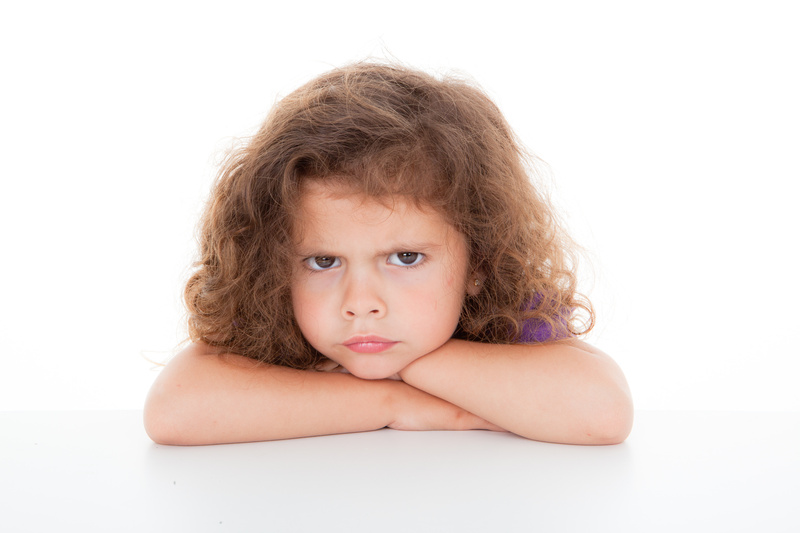 Children need to try negative behaviors out multiple times to learn new and old rules. Every good child scientist is constantly checking for new variables, holding others constant and examining the outliers. Be shocked, amazed and proud when a toddler learns a rule the first time as this is very, very rare. Remember, effective discipline is calm, confident and consistent. Being consistent, confident and calm, when you feel tired and frazzled by external stressors, is difficult. After all, knowing how to do something does not always mean we’ll have the drive to do it. I am the first to admit, as the author of this article on effective discipline, that I am an imperfect parent, though I strive to do my best. It is worth every resource you have to develop and execute an effective plan for discipline in the child’s early years while the consequences for negative behaviors are not so serious. Children may throw a fit when you discipline them, but they secretly expect and crave reasonable boundaries and consequences. You won’t be the “bad guy” until the teenage years, so enjoy that adorable pout and tantrum now because it only lasts a few minutes. Once children calm down, they will give you love and hugs. Toddlers amazingly release their anger quickly, but they will remember the results of their experiments. Expect that children will continue to experiment by adjusting for variables or double checking their findings. To create an effective discipline system, you must choose to be the experiments well-needed control and demonstrate to your child that no matter what variable they throw your way, you can remain calm, consistent and confident.